I’ve listed flax seeds or ground flax seed as an optional or add-on ingredient in several smoothie recipes, but this is the first to feature flax. Let’s get right into all the wonderful health benefits attributed to this superfood that records indicate having been cultivated as far back as 3000 BC. Flax seeds contain manganese, vitamin B1, magnesium, tryptophan, phosphorus, and copper, but these three ingredients are what flax derives its healthy reputation from: omega-3 essential fatty acids, lignans, and fiber. A plethora of studies and research has been done on the importance of omega-3 fats in our diet. They are vital to proper brain function, great for the heart, bones, and reduce inflammation, which is at the root of most disease. The lignans are anti-fungal, anti-viral, and are powerful antioxidants that significantly improve immune function. They also reduce LDL cholesterol. Flax contains a good amount of both soluble and insoluble dietary fiber. You can purchase either whole or ground flax seeds. Whole flax seeds have a longer self life, but ground flax is generally easier to work with. 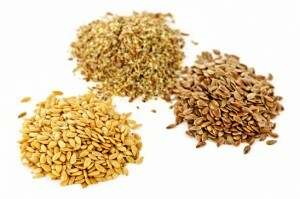 Keep flax seeds in the fridge and store extra flax in the freezer for maximum shelf life and nutrition. I prefer golden flax seeds for my smoothies, but the form you use isn’t nearly as important as actually adding it into your smoothies so you can reap the health benefits. Note, flax oil is also a good option. Put the ingredients into your blender and blend for 30-45 seconds or until the desired consistency is reached. If you try this smoothie please let me know how you liked it by leaving a comment below. Happy Blending! Wow, we must think alike…I made this exact recipe this morning (with the addition of a handful of spinach). It’s one of my faves! Healthy minds think alike! Adding spinach into the mix for some greens was a nice add-on. I’d recently started adding flax seed to my breakfast smoothie and was looking to see the benefits of it and came across your recipes and comments. Thanks for posting them. I’m looking for healthy smoothie recipes for my husband and I. This smoothie sounds delish, can’t wait to try more ! It sounds really good. Can’t wait to try it.